The San Lorenzo River is not a tame body of water. On its southern end, the vast floodplain created by its confluence with Branciforte Creek inundated the city of Santa Cruz several times over the past 250 years, even prompting the first Mission Santa Cruz to relocate atop the hill to avoid the near-annual deluges. North of the city, the river carved a tight path through a granite and limestone gorge, meandering wildly on its path toward the Monterey Bay. In Felton, the river slowed down and spread out again, aided by its confluence with Zayante Creek. 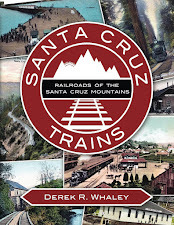 Yet the Santa Cruz & Felton Railroad was able to handle the river by largely avoiding it, while the South Pacific Coast Railroad crossed it only once, just south of Big Trees, over a bridge that ensured the river could not seriously damage railroad operations along the line. North of Felton, however, the Felton & Pescadero Railroad (a South Pacific Coast subsidiary)—later the Boulder Creek Branch of the Southern Pacific Railroad—had no choice but to finally confront the seasonally affective river. As it constructed its route to Boulder Creek in 1884 and 1885, the company was able, through geographic luck more than anything, to avoid the river for the first three miles. Fills and cuts along the east bank of the San Lorenzo River ensured that the railroad tracks had no need to cross the river. The most significant fills along this stretch were just out of Felton near Bonny Brae. Meanwhile, the most drastic cuts were just to the north, near Brackney. From there, a relatively flat area with an occasional short fill ran within the Glen Arbor area for nearly a mile until reaching the first substantial bridge along the branch at Newell Creek. Newell Creek did not require a substantial span to cross, but the creek was rather far below the grade level, so a trestle was not feasible nor did trestles appear at any place along the Boulder Creek Branch bar one. Instead, a short, wooden, double-intersecting Warren truss bridge was installed along two redwood abutments installed on either side of the creek. No pier was required, although the abutments may have been upgraded to concrete when the line was standard-gauged around 1908. Unlike the other bridges along the branch, the bridge over Newell Creek was probably not replaced in 1908 since it was so short and of a sturdy design that was capable of supporting the larger standard-gauge trains. As a general rule, the South Pacific Coast Railroad installed standard-gauge equipment whenever possible in anticipation of upgrading the line at some point in the future. The Newell Creek bridge was probably one such example of this. In this area, the railroad grade runs just to the southwest of Glen Arbor Road, so the bridge was located beside the road crossing over Newell Creek. No obvious remnants of the bridge survive today. To the east of Ben Lomond, Love Creek provided the second significant obstacle to trains heading north. The creek, named after former Texas Ranger Captain Harry Love, who helped killed the legendary outlaw Joaquín Murrieta Carrillo in 1853 and lived upstream for some years, was generally mild and posed no real problem for grading crews. While the specifics of the bridge are not known, it is likely that this location hosted the only trestle bridge along the line, since the creek was too near grade level to justify a truss bridge. As such, it almost certainly was replaced in 1908, since narrow-gauge trestle bridges are generally not strong enough to support standard-gauge trains and, in any case, require additional width to do so. No remnant pilings or other material related to the bridge survive, and the locations of the abutments on either end have been lost by subsequent property developments. Train crossing over the bridge near Hotel Ben Lomond, c. 1905. Note the panel siding on the truss section. 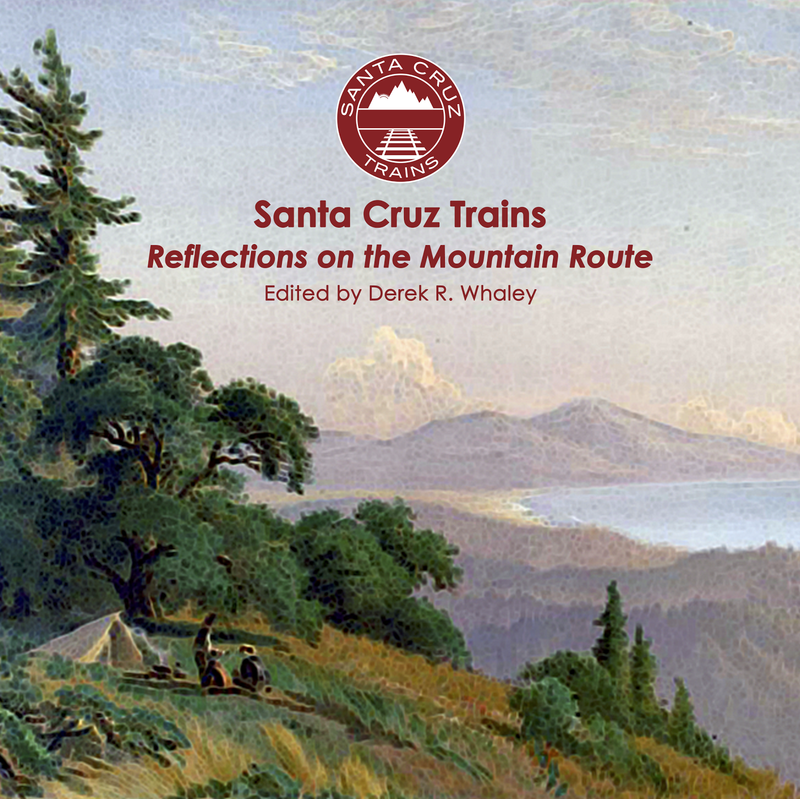 As the railroad route curved out of Ben Lomond, the track finally crossed the San Lorenzo River for the first time. The river is especially wide at this point with a gently-sloping embankment on the east and a sheer rock wall to the west. This crossing, therefore, required substantial bridgework to cross. Several photographs of the first bridge were produced as part of the marketing campaign by Hotel Ben Lomond, and these photographs showcase the bridge's unique style. From the east bank, a trestle bridge lifted the tracks from the railroad grade to a redwood-built pier on the river's edge. From here, an uncovered Howe truss bridge was installed over the river, which took the tracks to the west bank. Around 1895, Hotel Ben Lomond dammed the river to create a swimming hole, but passing trains had a habit of kicking rocks down on top of swimmers. Thus, the railroad installed wooden panels along the truss section of the bridge to minimize injury from rocks and, possibly, to make it more difficult for people to climb onto the bridge and use it as a diving platform. The bridge was upgraded for standard-gauge trains in 1908, which probably meant replacing the trestlework. 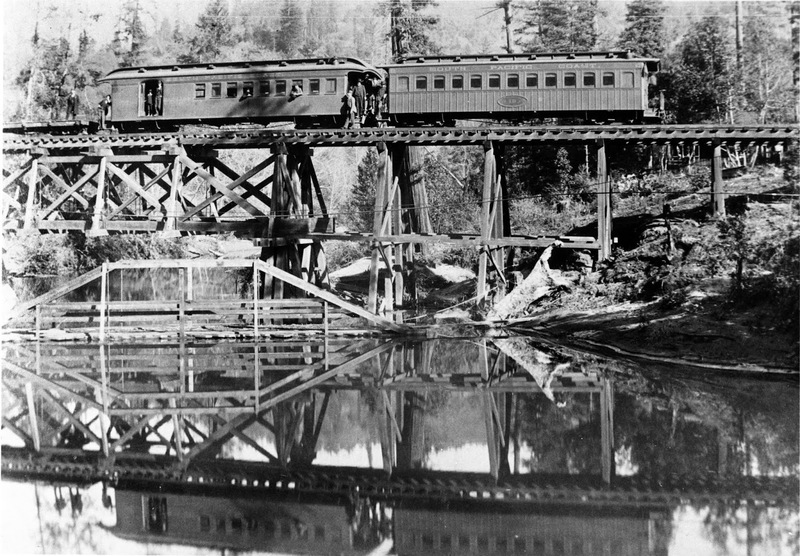 The truss bridge was replaced in 1919, probably with a prefabricated open-deck plate girder bridge, much like those used further north on the line. No photographs of the second bridge survive, but it was the last bridge installed along the route before its closure. Numerous pilings from the trestlework still survive on the east bank of the river behind the Tyrolean Inn, while the stone and concrete abutment on the west end can be seen across the river on private property. 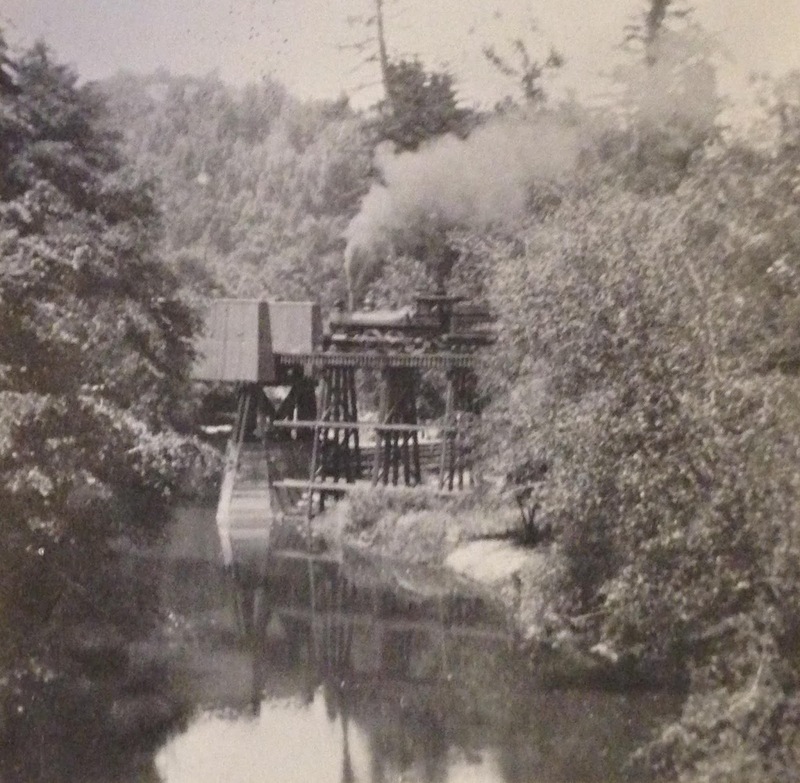 The later standard-gauge bridge over the San Lorenzo River near Phillipshurst, c. 1910. Further to the north, the San Lorenzo River turns sharply to the east creating a broad floodplain that the railroad had to cross near Phillipshurst. The bridge installed across the river here proved to be one of the most substantial railroad bridges built in Santa Cruz County. 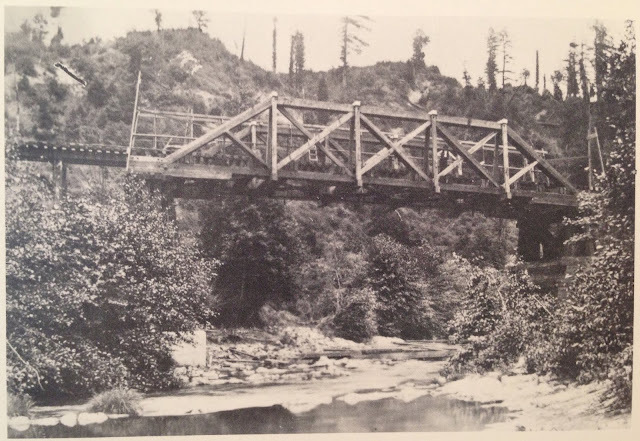 Measuring a total length of over 300 feet, the original narrow-gauge structure required three redwood double-intersecting Warren truss bridges, as well as a short trestle bridge, to cross. Redwood piers supported the structure at the truss joints while wooden abutments were located on either end. 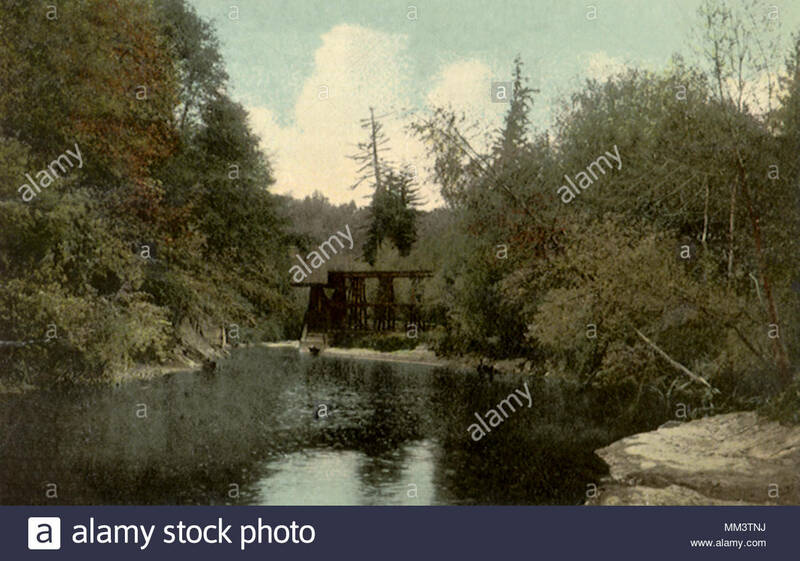 At one point, wood panels like those on the bridge beside Hotel Ben Lomond were installed on the sides of the truss spans, suggesting the area below was used as a swimming hole or for some other purpose. The trestle portion was replaced and the trusses upgraded in 1908 to support standard-gauge trains, but the increased weight prompted Southern Pacific to install tall concrete piers at the truss joints as well as midway along each truss span. Eventually, probably around 1913, the trusses were removed and replaced with a long prefabricated open-deck plate girder bridge set atop the concrete piers. A wood railing ran along the west side of the bridge. After the line was abandoned and the deck removed, the free-standing piers were repurposed to hoist a water pipe above the river to support the residents living along River Road. All six piers and the concrete abutment on the south side still remain intact, although access to the site is difficult. Standard-gauge bridge over the San Lorenzo River between Siesta and the Fish Hatchery, c. 1915. Crossing back to the west bank just before reaching the Fish Hatchery, the third bridge over the San Lorenzo River is widely known due to the several postcards that were made of it in promoting the railroad, Siesta, and Brookdale. The first bridge here consisted of a long trestle bridge from the southern embankment to the edge of the river itself. Here, a small, redwood double-intersecting Warren truss sat beneath the railroad tracks and over the deepest part of the river, flanked on either side by short wood piers. Another trestle bridge continued to the northern embankment. Around 1907, the trestlework was replaced to support standard-gauge tracks and the truss was removed and replaced with a prefabricated open-deck plate girder bridge mounted atop two hexagonal piers. It was this bridge that appeared heavily in marketing in the 1910s, when Fred Swanton maintained a swimming hole just north of the bridge. The two free-standing bridge piers can be seen today by driving along Larkspur Street and looking downriver. The last of the substantial non-river bridges along the Boulder Creek Branch was located over Clear Creek, between the Fish Hatchery and Brookdale. This creek is famous for passing through the Brook Room of the Brookdale Lodge. Very little is actually known about either bridge except that the narrow-gauge structure was the first to be replaced along the branch line in 1903. The original structure was likely a short trestle bridge over the creek. Clear Creek may have begun to damage the bridge over time, however, since a concrete culvert was installed at some point before 1903. The second bridge was capable of supporting standard-gauge trains and was composed of a short redwood deck installed atop two concrete abutments, the northernmost of which still survives. Railings and wooden walkways were built on both sides of the bridge for tourists and locals to more easily walk to Brookdale station. Access to the bridge site is not advised as it sits on private property. 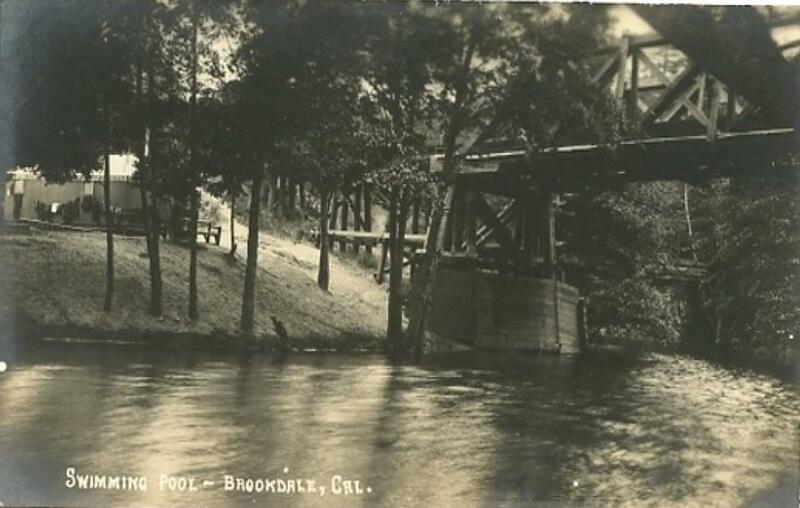 The narrow-gauge bridge over the swimming hole at Brookdale with tents on the shore, c. 1895. The final four bridges over the San Lorenzo River all sat within a short stretch of track between Brookdale and Filbert. The primary reason for this was that the river curved sharply three times around Huckleberry Island, the North Brookdale subdivision, and Camp Joy. Photographs of the bridge just to the north of Brookdale are by far the most common of these four. The original structure consisted of a short trestle bridge that ended at a wooden pier on the river's edge, at which point a now-standard double-intersecting Warren truss bridge crossed the deepest part of the river. The Brookdale swimming hole was located directly under the bridge here, but unlike Ben Lomond, no side panels were installed to stop trains from kicking rocks or to stop divers. No concrete piers ever replaced the redwood piers, but the truss was nonetheless replaced around 1913 with an open-deck plate girder bridge. Remnants of the northern pier survive, albeit in pieces, while pilings for both ends can be seen on either bank of the river. 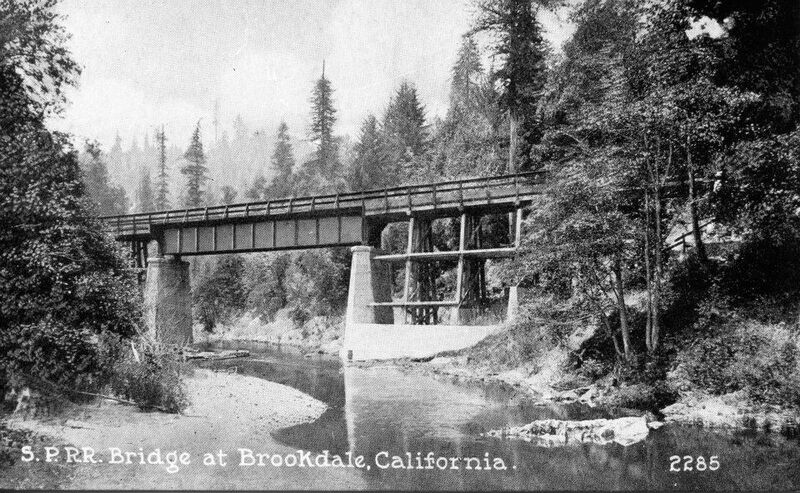 One of the narrow-gauge bridges across the San Lorenzo River between Brookdale and Boulder Creek, c. 1895. Only one photograph of each of the two bridges between Huckleberry Island and Irwin Way survives and it is not entirely clear which photograph depicts which bridge. The first iterations of both, however, were composed primarily of redwood, double-intersecting Warren truss bridges perched atop wooden piers that sat on either side of the river. From the piers, short trestle bridges linked the truss to both banks of the river. The truss section of the bridge north of Huckleberry Island was unusually replaced with a Phoenix Bridge Company truss span of unknown design around 1904. The other bridge was replaced a little later with a more standard prefabricated open-deck plate girder bridge perched atop concrete piers. The trestlework leading to these new bridges was replaced around the same time. 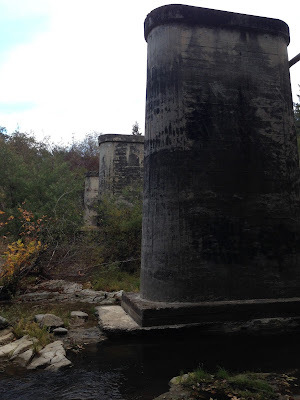 Today, three piers and several truncated pilings attest to these two bridges. The bridge piers on the north side of Huckleberry Island cannot be viewed at all without trespassing. Meanwhile, those south of Camp Joy are visible to the north of Irwin Way as it crosses the river. The final bridge before reaching Boulder Creek was situated in a sharp bend in the river just north of Camp Joy. 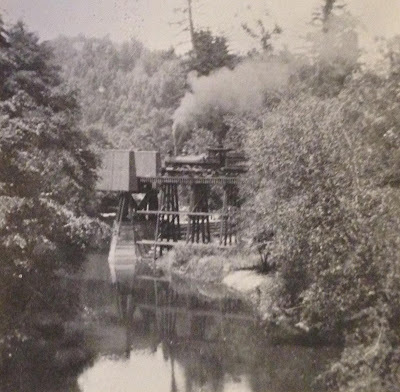 The track curved slightly across this bridge and continued to the north for an extended distance due to the presence of Malosky Creek, which crossed under the redwood pilings of the trestle as it approached solid ground near Filbert. Like all of the other bridges across the San Lorenzo River on the Boulder Creek Branch, this one was originally composed of a truss bridge of some design situated atop two redwood piers, with trestle bridges extending to either bank of the river. The bridge was upgraded and the truss replaced in late 1903, the latter with a prefabricated open-deck plate girder bridge, although the specifics are unclear since no photographs of this bridge are known. The southern pier is no longer extant, making it difficult to determine whether it was redwood or concrete. Considering its location, the pier, regardless of its composition, may have been destroyed during an especially bad flood, such as those in 1955 and 1982. The surviving pier can be viewed from Lorenzo Avenue off State Route 9. 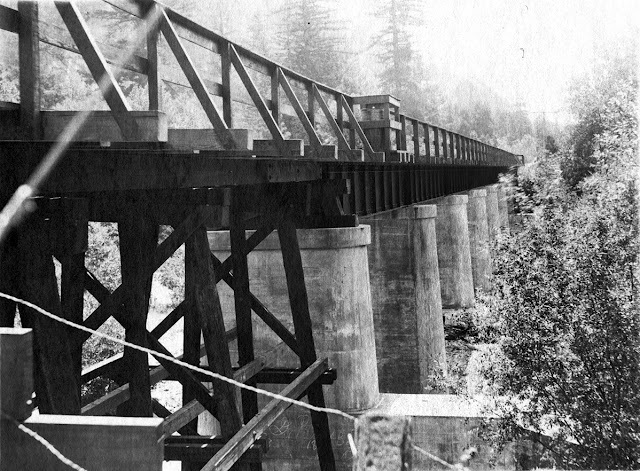 All of the bridges were dismantled in early 1934 after the closure of the Boulder Creek Branch. Traces of nearly all of the bridges survive in the form of concrete piers and abutments and sawed off pilings on the banks of the river. San Lorenzo Valley Museum, archival photographs.